Sport has been slow to get involved with social impact investment, and the sector has been slow to recognise the value of community sport. Now a new fund aims to connect the two and is seeking new applicants from across the country. ConnectSport spoke to Pete Maguire, from Sporting Assets, who manages the ‘Sporting Capital’ fund. What is ‘social impact investment’? This is where investment is made with the intention of making a tangible social impact as well as a financial return. The impact could be helping to deliver stronger communities, improving physical or mental health and wellbeing, or increasing education and employment opportunities for local people. When we provide funding to an organisation, we don’t just want the money back over time; we want them to have also delivered a social return for their community. Why is sport playing catch-up in this field? Unfortunately, the sport sector has been slow to get involved with social investment; whilst the predominant funding has been from grants, the sport sector has concentrated on these and, where they have looked at social investment, typically this has been focused on the more complex end such as social impact bonds. This means that in sport the promotion and take-up of socially-focused investment has fallen way behind the wider Third Sector. As an example, between them the Big Lottery Fund and Cabinet Office have invested more than £100million in capacity-building for the Third Sector – more if you include all the trusts and foundations – but less than 1% of this has hit sport. Why do you think attitudes are changing now? I think there’s always been that general consensus that sport can make a real impact in communities, not just in helping people to get physically fit but in terms of mental wellbeing and tackling loneliness, building links across communities and creating local jobs. But what we have seen over the last couple of years, especially since the publication of the DCMS Sporting Future strategy with its focus on social outcomes, is genuine momentum – both from inside sport, to understand what it must do to be taken more seriously as a force for social change, and from outside it, when organisations facing austerity and funding cuts need more creative solutions. People have talked about the 'power of sport' in vague terms for decades; now at last we’re just starting to articulate better what exactly it can achieve in terms of a social and economic return. Sporting Capital is an initial fund of £3million which offers simple unsecured loans of between £50,000 and £150,000 to community organisations which use sport to deliver wider social impact. The fund is aimed at specifically supporting these organisations to become more financially sustainable by helping them to generate revenue and build a successful community business. By doing this we help them to deliver lasting impact for their communities. Our aim is to fund around 30 projects by June 2020 and we are looking for applications from around the country. Cycle Pathway CIC, the social enterprise that operate Leeds Urban Bike Park was our first investment and a great example of what we're looking for. It is a facility that offers something for all of the local community, with activities that people of all abilities can get involved with - not only cycling but other physical activity, such as running; a community hub with a cafe open to everyone, and community space used by a number of different groups. It’s been a great start and now we’re looking for more community organisations to come forward and talk to us about whether we can support them. If we can prove the fund is having a big impact on a wide scale, then it will provide the evidence required to encourage more social investment into community sport in the future. At Sporting Assets, we believe sport plays a vital role in our communities, and we are passionate about supporting local people to develop strong and sustainable community businesses, and deliver much-needed impact for their local residents. 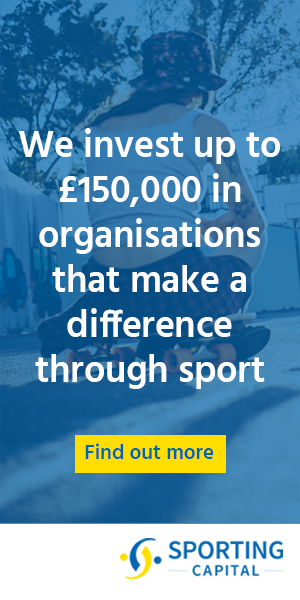 Sporting Capital has been formed through a pioneering partnership between Sporting Assets and the Access Foundation; and is funded through the Big Lottery Fund and Big Society Capital. To find out more visit www.sportingcapital.org.uk or follow @SportingCapFund on Twitter.